There are three visual distances I talk about in our coaching practice. One isn't better than the next, all three are required. If you're going to move from where you are to where you want to be...know all three. 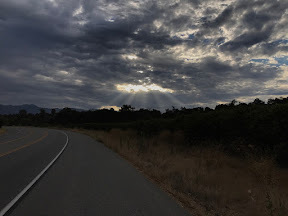 Out for a bike ride around Lake Casitas, in Ojai, California this morning, I came around a corner to see this opening in the sky. Light raining down over a horizon I couldn't see; light calling us forward to a "next thing." Clear: At this level, what you're working on, what you're responsible for, what you're accountable to is all known. Your to-do list is current, your inbox is under control, your backlog of projects is exactly what you've agreed to complete. (Promises made to yourself AND others. If you feel stress - at this level, in this present moment - it's because something from your past or future is pulling on you; perhaps even weighing on you. The stress you feel CAN be minimized by spending an extra "Focus Session" on gaining clarity. Blur zone: Here, your intuition is in full gear. You've experienced it... for some reason you look off to the right, when you could have looked left. There, you notice something, or someone. You have a thought you'd never had before. Or, you stop thinking about something not serving you. Open up, let yourself be uncomfortable in the blur. Because you don't know everything that's going to happen, you've got to be ready for anything that COULD happen. Over the horizon: And, that magical place that Rumi described... Not right. Not wrong. Beyond all that is a place I'm willing to go. Out there, there is more for us to see. To find. To do. And, to BE.